The idea of creating a sports discipline however was the brainchild of Italian mountaineer Marino Giacometti, who, with a handful of fellow climbers, pioneered records and races on Mont Blanc and Monte Rosa in the Italian Alps in the early ‘90’s. In 1993, with the support of the multinational Fila as sponsor, skyrunning took off across the world’s mountain ranges with a circuit of awe inspiring races stretching from the Himalayas to the Rockies, from Mount Kenya to the Mexican volcanoes. After all, Giacometti’s term skyrunning*, as the name suggests, is where earth and sky meet. 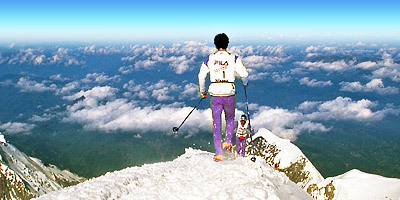 Today, the sport is managed by the International Skyrunning Federation which took over from the FSA in 2008. The principal aims of the ISF are the direction, regulation, promotion, development and furtherance of skyrunning and similar multisport activities on a worldwide basis.